It’s 2018, and the military’s new Blended Retirement System (BRS) has begun. What is the BRS and what does this mean to you? People who join the military after 1 January 2018. They will be under the BRS. Anyone who entered (enters) the military before 31 December 2017, and has less than 12 years of creditable active duty service or 4320 reserve points on that date, will be eligible to opt-in to the BRS. Opting-in to the BRS must occur before 31 December 2018. This decision is irrevocable. No one currently serving on 31 December 2018 will be moved to the BRS unless they request it. Currently serving forces who have more than 12 years of service or more than 4320 reserve points on 31 December 2018 are not eligible to opt-in to the BRS. They will remain under the old, “legacy” retirement system. This may be either High 3 or CSB/Redux. For those with unique situations, there’s a relatively simple way to see if they are eligible to opt-in, using their Date of Initial Entry into Military Service (DIEMS) and Pay Entry Base Date/Pay Entry Basic Date/Pay Entry Date (PEBD.) Note for our Marine friends: You use the term DEAF, for Date of Original Entry Armed Forces, instead of DIEMS. Start with your DIEMS date. 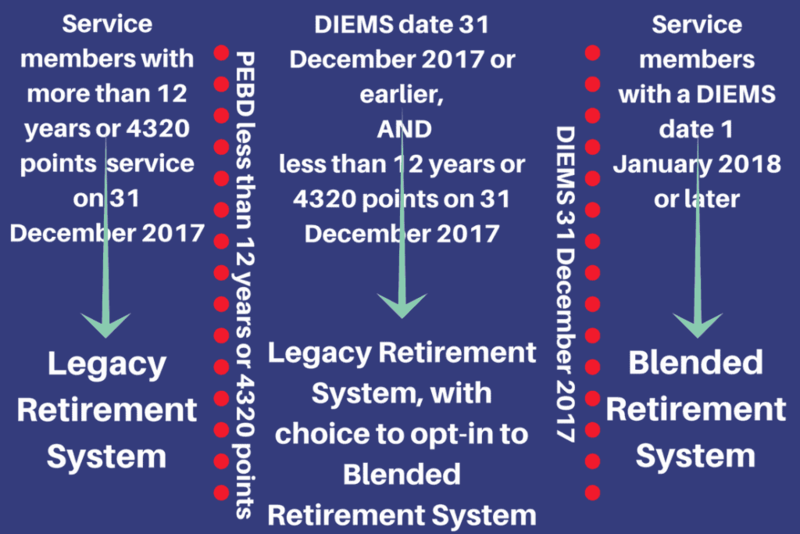 If your DIEMS date is 1 January 2018 or later, you’re in the new Blended Retirement System. If your DIEMS date is 31 December 2017 or earlier, then look at your PEBD. If your PEBD is 12 years or more (or 4320 points or more) on 31 December 2017, you’re in the old, legacy retirement system. If your DIEMS date is earlier than 1 January 2018, but you do not have 12 years (4320 points) on 31 December 2017, you are grandfathered into the old, legacy retirement system, but have the choice to opt-in to the new BRS. This applies to students at the military academies, Reserve Officer Training Corps members, and those enrolled it the Delayed Entry Program (DEP.) If their DIEMS is before 1 January 2018, they will be grandfathered into the legacy system with the choice to opt-in to the new BRS. If they begin active service in 2018, they will have the remainder of 2018 to opt-in. If they begin active service after 2018, they will have 30 days from the first day of active service to opt-in to the new BRS. Retirement pay benefits for currently retired service members remain unchanged. A defined benefit plan is a plan that has a set amount of benefit based upon certain criteria. Most traditional pensions, including military retirement pay, are a defined benefit plan. Defined benefit plans are tied to the employer. The individual funds are not attributed to an individual employee. The Department of Defense often uses the term annuity to explain the military retirement pay system because it is a series of payments. A defined contribution plan is a special kind of investment account. The employee, and sometimes the employer, contribute various amounts to the account throughout the employee’s working career. Most current retirement plans, such as 401(k) plans, are defined contribution plans. The federal government and military’s Thrift Savings Plan (TSP) is a defined contribution plan. The employee owns the balance of the account (with vesting restrictions) and can transfer it with them between jobs. The military already offers both a defined benefit (military retirement pay) and a defined contribution (TSP) opportunities. The BRS changes each part a little. The first three of these changes make up the important parts of the new BRS. The last part, the partial lump sum retirement payment option, is not really related to the rest of the overhaul. In the simplest possible terms, the blended retirement system moves a portion of the total military retirement benefit from a defined benefit plan to a defined contribution plan. The biggest change of the BRS is the addition of government contributions to an individual’s Thrift Savings Plan (TSP) account. Under the legacy retirement system, there is no government contribution to TSP. The new BRS features both an automatic government contribution and a government match of the service member’s contributions. Together, these government contributions will give service members retirement money that is not tied to a 20 year military career. New service members will have a TSP account created for them. Service members under the new plan will be automatically enrolled to contribute 3% of their base pay to their TSP account. If the service member stops or reduces the amount of their contribution to less than 3%, they will be switched back to 3% at the beginning each year. Disenrollment or reductions are only permitted after financial literacy education. Service members have their contributions pre-set to go into the Lifecycle fund that corresponds to their current age. They may change this election at any time. Service member contributions are assigned to a Traditional TSP account by default, and the member may change his or her contributions to a Roth TSP account. Government contributions will always go to the Traditional account. The automatic government contribution equals 1% of the service member’s base pay and will begin after 60 days of military service. * These contributions will continue until 26 years of service. This money will be “vested” after two years of service. Vesting is the point in time when the ownership of the money moves from the contributor to the TSP owner. *Service members who opt-in to the BRS will receive automatic contributions as soon as they opt-in. The 24 month service requirement for vesting applies to automatic contributions. The BRS features a government match of service member contributions after two years of service* and continuing through 26 years of service. The government match of the service member’s contributions can be a little confusing, because it isn’t straight line one-for-one. You’ll sometimes hear people say “4% match,” and you’ll sometimes hear people say “match up to 5%.” Neither one is exactly accurate. The government will 1-for-1 match the first 3% of a service member’s contributions to TSP, and then they’ll match at half, or .50-for-1, service member contributions over 3% and up to 5% (so, 4% and 5%). If a service member contributes 5% or more to TSP, the government match will be 4%. Government contributions to member’s TSP accounts will be vested immediately. *Service members who opt-in to the BRS will receive matching contributions as soon as they opt-in. The two year service requirement for matching contributions does not apply to those opting-in. Under this blended retirement plan, service members would receive a smaller defined benefit pension as compared to the legacy High Three. Under current law, retirees who selected the High Three retirement plan (not CSB/Redux) earn retirement benefits at a rate of 2.5% per year of service. For 20 years of service, a current retiree earns 50% of the average of their highest 36 months (three years) base pay. Under BRS, retirement benefits would be calculated at a rate of 2.0% per year of service. Therefore, a service member who retires under the blended retirement plan would receive 40% of the average of their highest 36 months (three years) base pay. Continuation pay is a taxable bonus that will be paid to service members, mid-career, in exchange for an obligation to continue to serve for another three years. Continuation pay will be offered between eight and twelve years of service. The exact time will be determined by their branch of service, who will be able to modify the timing of continuation pay to meet their needs. In theory, the obligation that comes with continuation pay will run concurrently with any other service commitments. More clarification is needed on this point. Continuation pay will be calculated as a multiplier of monthly base pay. It will be between 2.5 and 13 times monthly base pay, with the exact amount to be determined by the branch of service. I am assuming that the branches will tailor their continuation pay packages to reflect the retention needs of their different fields. Prior experience with variable bonuses suggests that most people would receive bonuses significantly smaller than the allowed maximum. Continuation pay can be received in a lump sum or a series of equal annual payments, stretch over a maximum of four years. Service members who accept continuation pay but fail to complete their obligated service may be required to repay the amount received. A pro-rated repayment may occur in some situations, and may depend on the reason for not completing the obligated service. Because of the many paths of military service, some service members who are eligible to opt-in to the BRS may not be eligible for a Continuation Pay bonus. Be sure to get more information about your exact details before making a decision. The BRS contains an option for retirees to receive a portion of their military retirement pay benefit in a lump sum. This is a little confusing, and frankly, it’s a bad deal for the service member. I’d honestly rather you just never consider it and skip right on to the next section. But it is part of the BRS, so I’ll give you the details here. The lump sum option can only be used for the amount of retirement pay that will be received before reaching Social Security full retirement age. Military retirement pay reverts to the full amount once the service member reaches full retirement age. The retiring service member requests 25% or 50% of the gross estimated retirement pay for that period of time (from the receipt of retirement pay until full retirement age.) The present value of that retirement pay is calculated using a discount rate that will be determined each year by the Department of Defense. Because of the way that the present value of future payments works, the present value will be significantly less than the projected payment amounts. 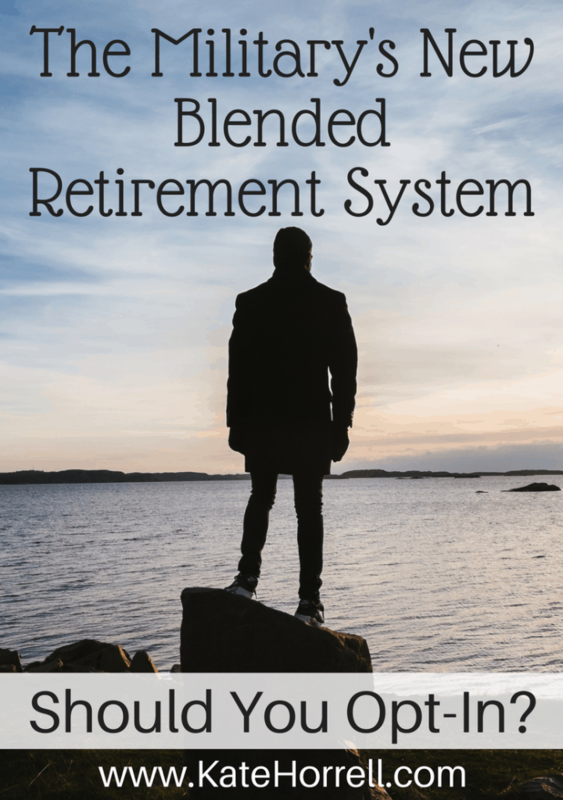 You can find a complete explanation of the math behind the lump sum payments in Blended Retirement System Implementation at Military Life Planning. The retiree may choose to receive the lump sum payment as one payment or up to four annual installments. Lump sum payments be treated the same as all other military retirement pay with regard to court orders, including the division of military retirement pay in divorces. The lump sum option will change some details of how the Survivor Benefit Plan (SBP) functions, but should not change the underlying principles. As I understand it, will still be calculated based upon the regular retirement pay amount. More details will be forthcoming. Don’t forget: the only group who is eligible to choose between retirement systems are those who have a DIEMS date of 31 December 2017 or before, but have not yet reached 12 years of service or 4320 reserve/Guard retirement points as of 31 December 2017. The best part about the new BRS is that all service members who serve at least two years will leave the military with some government-funded retirement savings. Over 80% of military members leave the service before reaching retirement age. Under the old, legacy retirement plan, those folks leave the military with no government-funded retirement savings. If you think you’ll leave the military before reaching retirement age, switching to the BRS is clearly the right choice. Be sure to contribute to your TSP account to get the full government match. You have a harder choice if you think you will stay in the military until retirement. The 20% reduction in the military pension is a lot. Even if you contribute enough to get the full government match to your TSP account, you’ll need solid investment returns to earn enough to make up the 20% cut in retirement pay. Remember that even if you plan to serve until retirement, this may not happen. You may end up leaving the military prior to reaching retirement age due to family issues, reductions in force, medical concerns, failure to promote, or failure to meet physical readiness standards. As much as you may love the military, life doesn’t always work out the way we expect. The Department of Defense is constructing a BRS comparison calculator, but it seems to be running into some challenges. It is already well past the announced availability date, and I haven’t heard anything about it coming out anytime soon. Update: It’s out!! USAA has released a BRS retirement comparison tool that gives some quick math to compare the two options, but you’ll still need to look at your whole life picture to make the right decision for you. The period to switch to the BRS will run from 1 January 2018 to 31 December 2018. Air Force, Army, and Navy members will make the selection in DFAS on the “myPay” website. The Marine Corps, Coast Guard, USPHS and NOAA have not yet announced their selection procedures. If you do plan to switch to the BRS, I encourage you to do it as early as possible. This will give you up to 12 months of extra government automatic contributions and government matching funds. There’s a lot to like in the military’s new Blended Retirement System. Service members will accumulate government-funded portable retirement savings that aren’t tied to 20 years of service, and those who do reach retirement age will have the flexibility of a individually-owned TSP account as well as the security of military retirement pay. However, the government contributions to the service member’s TSP may not earn enough to make up for the lower military retirement pay, and service members who do not contribute enough to earn the full government match will definitely come up short in the big picture. The decision whether to switch to BRS is very personal and requires you to look at your big picture financial planning. There is a lot of mis-information floating around about the BRS. Please share these facts with your friends, co-workers, and family so that everyone is working with the information.